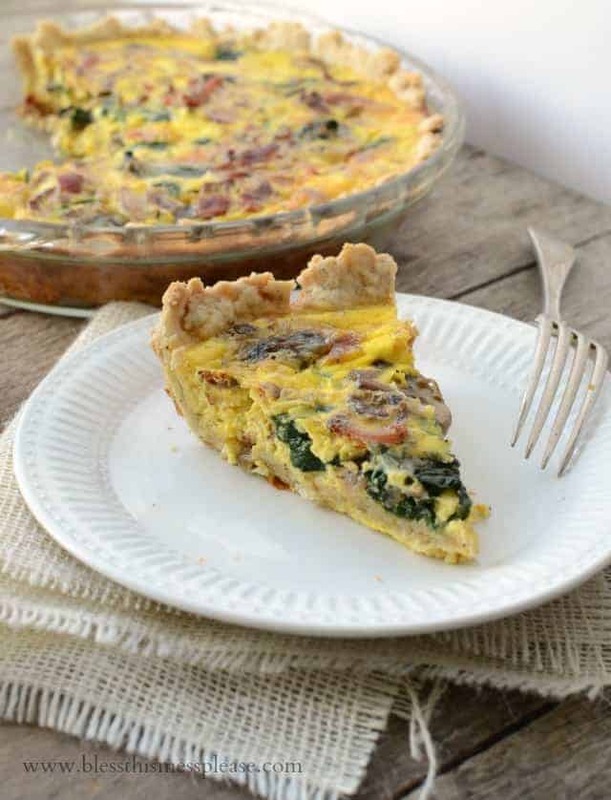 This Spinach Bacon Quiche is full of vegetables, eggs and bacon but lighter in calories. Total win in my book! Country life is a happy one but it isn’t without a few sacrifices. I’ve given up the convenience of restaurants, and I miss having neat places to take the kids once in a while like museums, aquariums, and parks. But do you know what I miss most of all? The library! Libraries are so amazing to me. We have giant buildings where all kinds of knowledge in the form of books are stored and we can just walk in and borrow all of that knowledge for free! The town that we used to live in had a grand library. Sometimes after the kids were in bed and my husband was up late studying, I would take myself on a date to the library and check out stacks and stacks of books. I went plenty with my kids, but there is something magical about roaming shelves of books alone. I always felt like I was on a treasure hunt! One of my very favorite types of books to pick out were cookbooks of course! 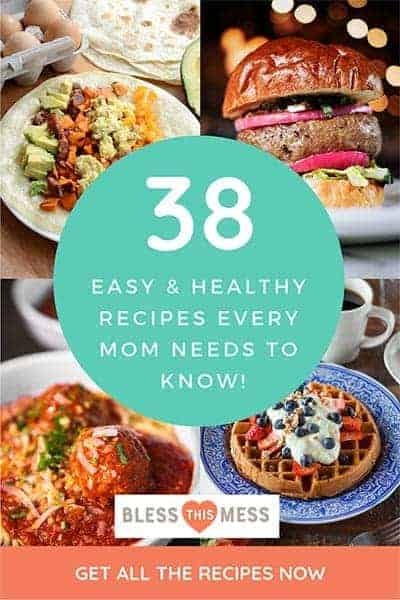 I loved going through them and copying the recipes I wanted to try, reading the tips and tricks, and learning new things. In that library is where I discovered Cooking Light Magazine. At the end of every year, Cooking Light publishes a compilation cookbook of the years’ most popular recipes. I think that I had the 2011 Cooking Light cookbook out for months! 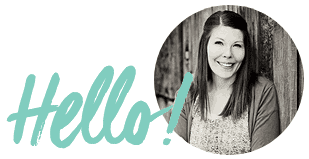 Here’s what I learned about Cooking Light. They cook smart. They are big on using good quality, seasonal, flavorful foods so that you don’t even know you are saving calories. They don’t use weird things like calorie free sweeteners or turkey bacon to save on calories (bacon = pork). They are full of great tips and tricks. I love learning more about cooking, especially healthy eating. Occasionally I’ll pick up a Cooking Light Magazine now and I’m always so glad when I do. If you are looking for a little spring pick-me-up in the kitchen then you’ll love the deal that Target has right now. 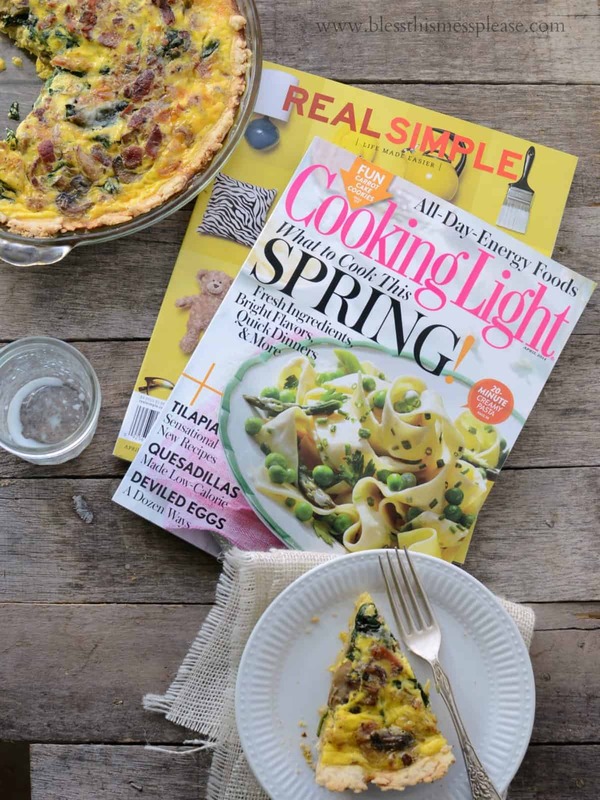 When you buy the April issue of both Cooking Light and Real Simple (Cooking Light’s sister publication) then you’ll get a $5 gift card back. And you know that five more dollars to Target is never a bad thing. 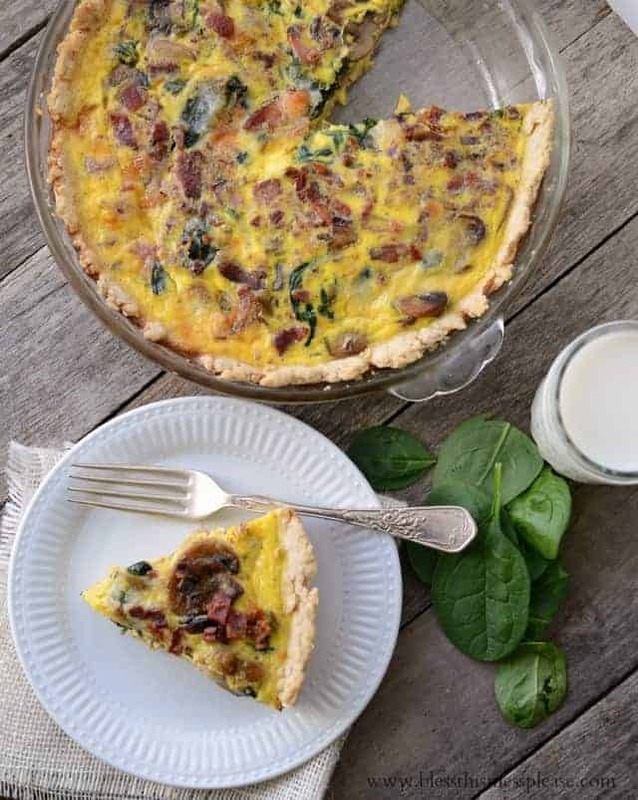 I had so many recipes to choose from for today’s post and I decided to go with a deliciously rich and flavorful Spinach Bacon Quiche from the April issue of Cooking Light. I’m so glad I did; it was delicious! I love when I can have vegetables be part of a meal and no one even notices that they are there. All of the flavors are just perfect together. The article said that most quiches have over 600 calories per serving and this beauty came in at less than 350 calories per serving. And they aren’t stingy on the serving size either, it’s 1/6 of the pie! I don’t make pie often (once a year maybe), so my crust is ugly. But ugly crust aside it was delightful. The crust is where some major calories are saved. It’s a savory crust made with olive oil for the fat instead of butter or Crisco. It came together well and was my kids’ favorite part. It’s a little different than your usual crust but I think you’ll like it. Plus, it came together pretty easily; you make it in the food processor! I also love that Cooking Light isn’t afraid of things like bacon! You fry up three pieces for this recipe and then cook the veggies in the drippings. I normally would have used a lot more but three pieces was plenty. The flavor was there in all of it’s bacon glory! I love recipes that use eggs. 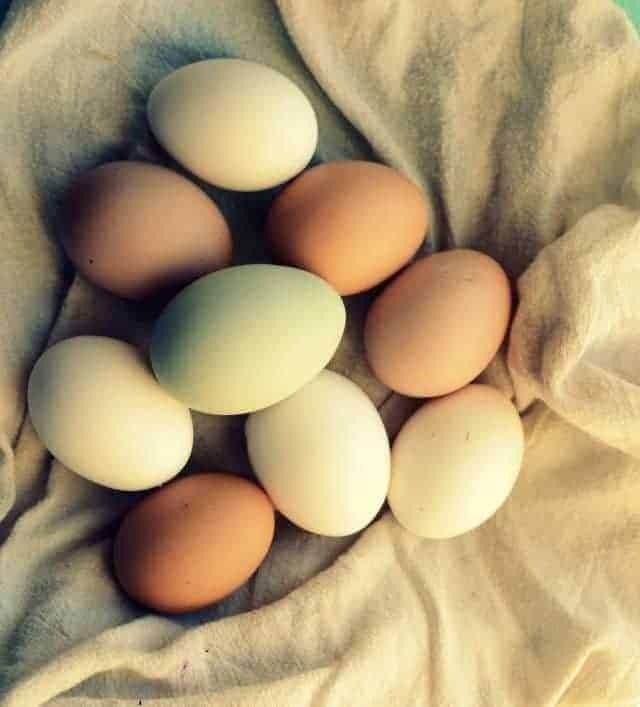 I always have more than enough eggs thanks to my hens. Enjoy this lightened up version of a classic and plan on seeing a few more recipes from Cooking Light because I made a long “to try” list! They had a whole slew of recipes dedicated to the ever popular tilapia and some carrot cake whoopie pies that I’m really excited about. Preheat the oven to 425 degrees. Lightly spoon flour into measuring cups, level the top with a knife. Add the flour, salt, pepper, and baking powder to the bowl of a food processor. Pulse a few times to combine. With the food processor on, slowly add the olive oil and water though the chute. Process until the dough comes together. Turn the dough out onto a lightly floured surface and press it all together into a 6 inch disk. Wrap in plastic wrap and refrigerate for 20 minutes. Roll the chilled dough into a 12 inch circle and place it gently in the bottom of a 9-inch pie plate that has been coated with cooking spray. Bake the crust at 425 degrees for 12 minutes or until the edges start to turn a light golden brown. Let the crust cool on a wire rack. Cook the bacon in a large skillet over medium-high heat until crisp. Remove from the pan and let cool on a paper towel and then crumble. Leave the bacon drippings in the pan and return the pan to medium high heat. Add the red onion and cook for 2 minutes. Add the mushrooms and the thyme and cook for 10 minutes, stirring occasionally. Add the spinach and cook for 2 minutes or until the spinach wilts. Remove the pan from the stove and let the mixture cool for 10 minutes. Place the milk, half-and-half, eggs, and salt and pepper in the bowl of the food processor or in a blender and process or blend until the mixture is smooth. 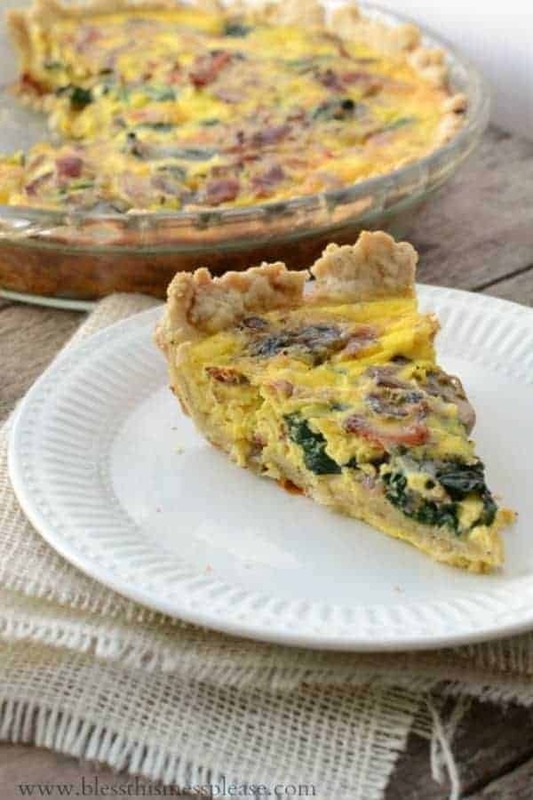 Arrange half of the cheese in the bottom of the cooled crust, add the spinach mixture, top with the remaining half of the cheese and then slowly pour the milk and egg mixture over the cheese. Sprinkle with crumbled bacon. Bake at 350 degrees for 40 to 45 minutes until the filling is set in the center. Let stand for 10 minutes before serving. Thanks so much for for stopping in and enjoy the delicious quiche. MMM!!! 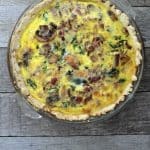 I love quiche and this looks fabulous! Great idea for brinner (which we have at least twice a month)! 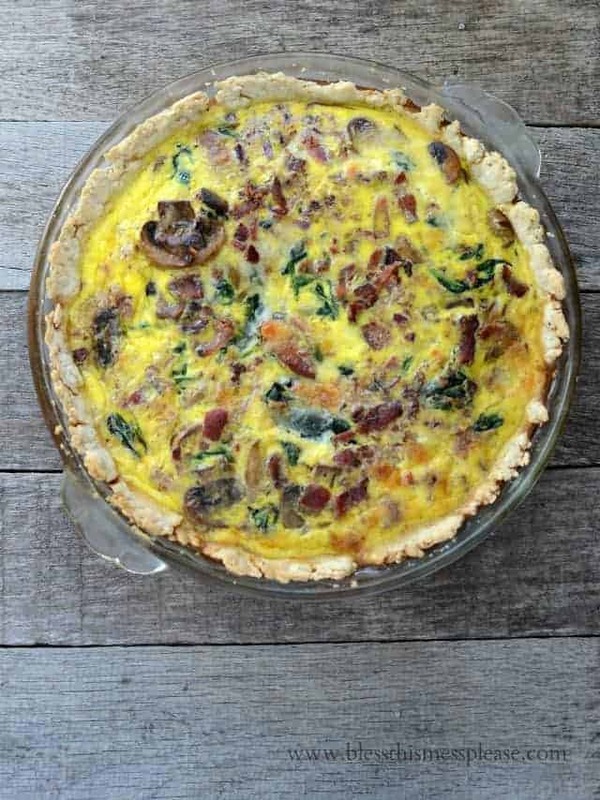 I am not familiar with pie crusts at all, do you think I could make this on a Sunday and then use the crust for this quiche on a Thursday? Would the crust still be good and how would you suggest I store it in the in-between time? Or is it better to make the dough, then store that and roll/bake the crust the day I plan to use it? Thank you.